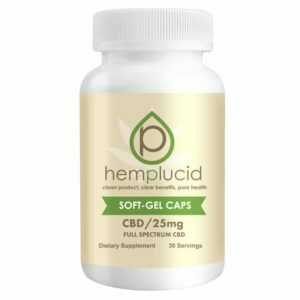 Hemplucid’s CBD capsules give the benefits of Whole-Plant Full Spectrum CBD structure without the green after taste in an easy to swallow soft gel cap. Their CBD products contains cannabinoids, vitamins, minerals and terpenes that are are potentially missing from our diets. 15mg 25mg, & 50mg cannabidiol per capsule dosages available. 30 capsules per bottle.